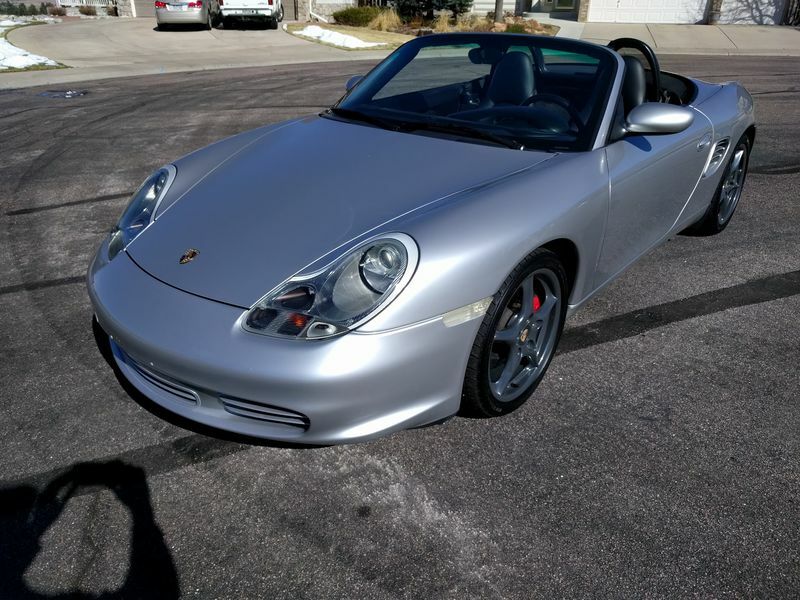 2004 Boxster S, manual, Arctic Silver, Black top and interior, PSM, heated seats, Litronics headlights, OBC, Bose premium stereo, 18” Carrera light wheels. 114K miles. $11,400 OBO. Car located in Castle Rock just south of Denver CO.
Moving and I can’t take the car with me. Everything that I know of that is wrong, or could go wrong, has been fixed on this car. In the last 2 months have replaced the AOS, water pump (Porsche OEM), battery (Redtop), Spark plug’s, Oil/oil filter, Air filter, Accessory belt, Belt pullys, new Lloyd floor mats, windshield, and had the bushing for the shifter linkage replaced going into the transmission. The LN ceramic IMS bearing, RMS and clutch were replaced at 65K miles. Also upgraded to the LN 160 F thermostat and spin-on oil filter adapter. All service history since I bought the car with 9000 miles on it back in 2006. All original manuals and literature included. Extras: 17” turbo twist rims with snow tires, several books on the Porsche Boxster, Bently service manual, Porsche coolant, transmission fluid, oil, motor mount, air filter, Durametric OBD2 reader, and lots of other little items. The car was in an accident 2012, which resulted in new front bumper cover, hood, right fender, and right headlight. No air bags deployed and the alignment was not affected, and in fact I drove it for 6 weeks before it could be scheduled into the shop. Repair was done by Stuttgart auto body who is a Porsche authorized repair facility.. The car is in extremely good shape, but after 114K miles and 14 years there are some paint chips (minimal since it has a clear-bra) and some very minor door dings. This would make a very good first Porsche. Currently I have it listed on Cars.com, if you want some more pictures. Ken is this car still for sale?